To edit a user go to Company > Employees. Select the edit button adjacent to the relevant employee. This will bring you to the basic details page. Amend the details as required. After amending each page, select ‘Update‘. Tabs ‘Basic details’, ‘Roles’ and ‘Organisation’ have been usually filled in during employee creation process which is documented here . Additional tabs allow you to manage employee profile, add notes and see the employee history. In this tab one approver or multiple approvers can be assigned to the employee. When you add approvers from the list don’t forget to click ‘Update‘ button to save changes. 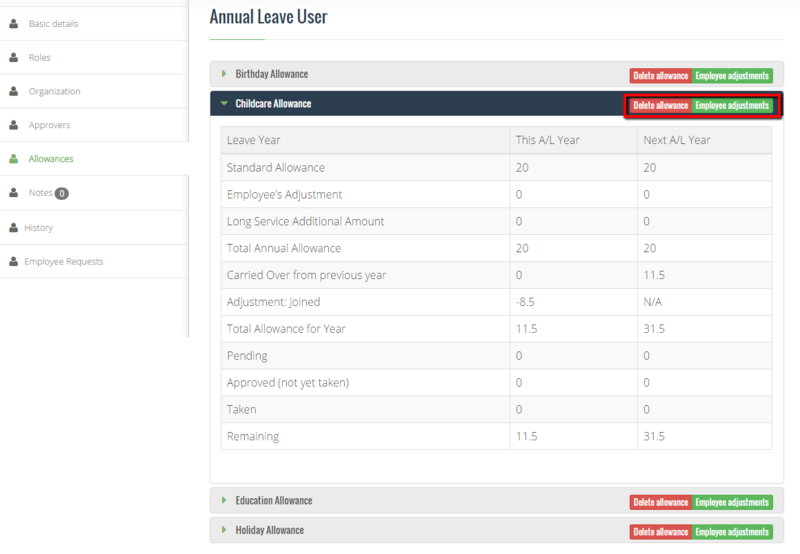 Allowances can be also deleted using red ‘Delete allowance‘ button beside each allowance type. For each Allowance Type we can modify the values using green ‘Employee adjustments‘. 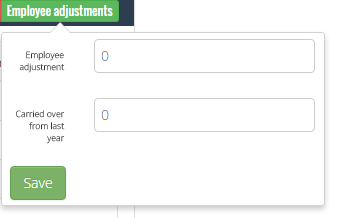 Once ‘Employee adjustments‘ is clicked you will see 2 fields where you can enter values. Employee adjustment is a permanent adjustment that will apply to all years of allowance. Carried Over adjustment can be used to add days that have not been used in previous year. Both fields accept positive and negative values. In this tab all employee notes can be previewed and new notes can be added. It is a common place to share any information about employees if multiple HR users are managing the company account. 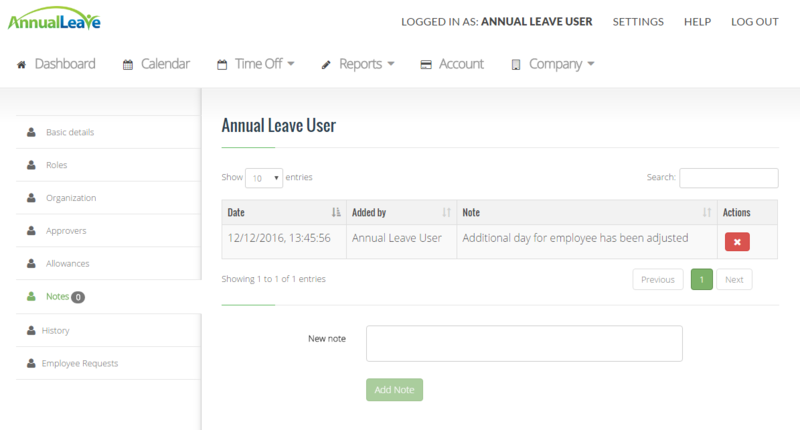 This screen presents a log of actions and changes made to the system around each employee. The system produces this history automatically. We can use sorting functions to present the data in a different order depending on the needs. All historical requests for selected employee are visible on this page. HR users can cancel requests, delete canceled requests and create new requests for employee bypassing approval process. 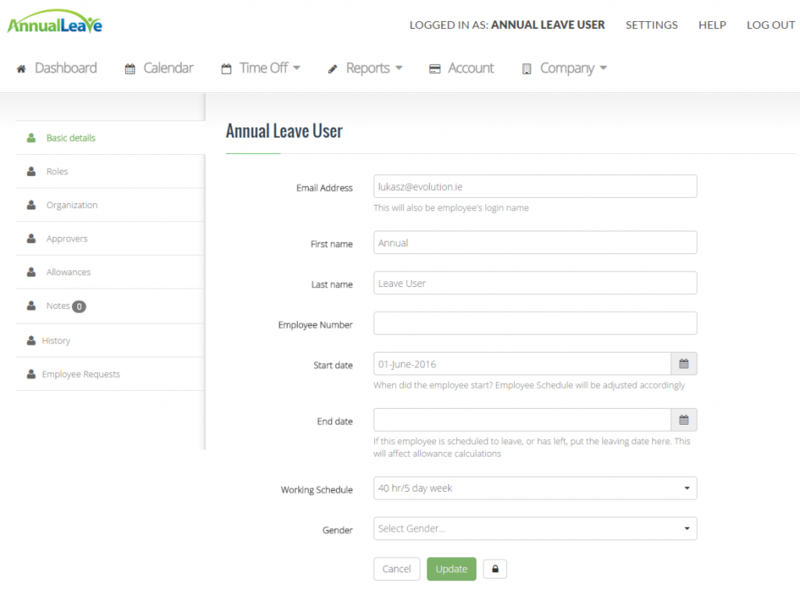 This screen will be also used to record absences that cannot be added by a user. Each request history can be previewed by clicking green ‘History’ button beside delete/cancel.